Here is some interesting new for artists looking for a CAD tool that works with Linux. 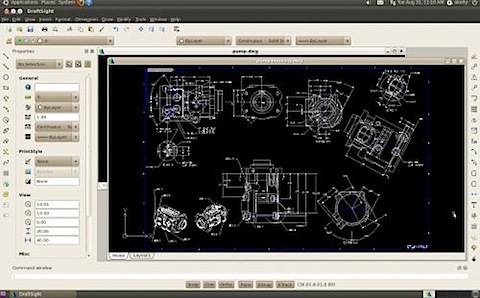 A tool called DraftSight now has a version that work with Linux, and by what I could dig about the too, it`s pretty much a good alternative to AutoCAD and with the ability to read and edit DWG files. The DraftSight beta is available to download with versions for Linux, Windows and Mac OS X. Below you will find a screenshot of the tool on a Linux OS. And for those of you curious about how DraftSight works, I found a couple of video tutorials that shows a bit more of the tool. Unfortunately DraftSight is not open source, but a Freeware like other AutoCAD like tools. I have showed some of them here before, like DoubleCAD XT. If you are looking for an option to open and edit DWG files on Linux, you might want to take a closer look on DraftSight. Thanks to Pablo Assis for the tip.